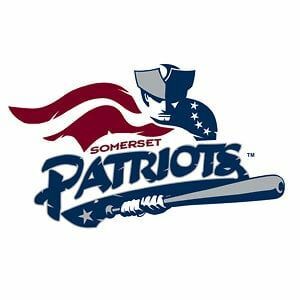 Somerset Patriots Day, 4/28 1 pm, GET YOUR TICKETS NOW! As a final reminder, tickets are still available for SHLL members to the Somerset Patriots vs New Britain Bees game on Sun, 4/28 @ 1:05pm. There are many exciting things that will happen at the ball park that day. First, there will be an 11:00am Softball Clinic down on the field led by coaches and instructors from the Jennie Finch Softball Academy at Diamond Nation. Paw Patrol's Chase and Marshall will also be making an appearance at the game and will be available for pictures on the main concource between 1-3pm. Kids will also be able to get autographs from players before the game and run the bases after the game. This is always a fun annual event for Somerset Hills Little League. Tickets are available for $12 each and can be purchased through our SHLL site below. You can then pick up your purchased tickets at the Kiwanis Snack Shack this upcoming week (speak to an SHLL Board Member that's present). Let's get a great SHLL turnout at TD Bank Ballpark for the game next Sunday. 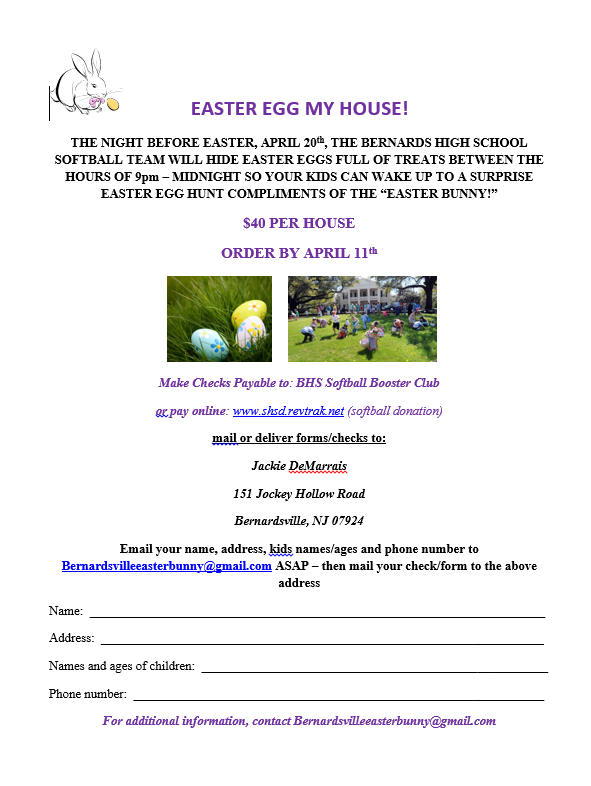 The BHS Softball team is having an Easter Egg Hunt Fundraiser. Please support a great event! Deadline is tomorrow, April 11th. Tickets are still available for the Somerset Patriots game on 4/28. Please come out and enjoy a game of local baseball, see some former MLB players, and meet Chase and Marshall from Paw Patrol! Use the link below to purchase tickets. To pick up tickets, please go to the Snack Shack and speak with a Board Member present. Brian Gallagher will be available to hand out, starting tomorrow night if the weather holds up. Still looking to get some baseball or softball gear for this Spring Season? Gotta go to Mo's!! Modell's is offering SHLL Members a "Team Weeks Program" through May 2nd. 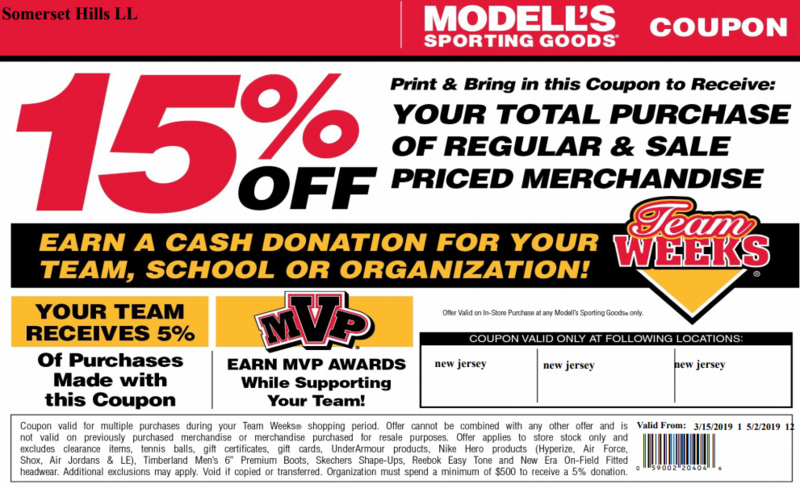 Please print/show this coupon (posted in the announcements section of the SHLL website), bring with you to any Modell's Sporting Goods in NJ and the program feeds back to our league with your purchases.